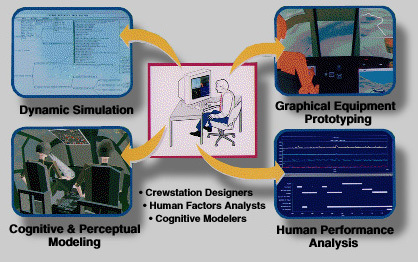 The Man-machine Integration Design and Analysis System (MIDAS) is a 3-D rapid prototyping human performance modeling and simulation environment that facilitates the design, visualization, and computational evaluation of complex man-machine system concepts in simulated operational environments. MIDAS combines graphical equipment prototyping, dynamic simulation, and human performance modeling with the aim to reduce design cycle time, support quantitative predictions of human-system effectiveness, and improve the design of crew stations and their associated operating procedures. MIDAS links a virtual human, comprised of a physical anthropometric character, to a computational cognitive structure that represents human capabilities and limitations. The cognitive component is made up of a perceptual mechanism (visual and auditory), memory, a decision maker and a response selection architecture ( Micro Saint Sharp). The complex interplay among bottom-up and top-down processes enables the emergence of unforeseen, and non programmed behaviors. MIDAS outputs include dynamic visual representations of the simulation environment, timelines, task lists, cognitive loads along 7 resource channels, actual/perceived situation awareness, and human error vulnerability and human performance quality.